This book considers the problem of managing the unfinished business of a violent past in societies moving out of political violence. Truth Commissions are increasingly used to unearth the acts committed by the various protagonists and to acknowledge the suffering of their victims. This book uniquely focuses on the conditions which predispose – or prevent – embarkation on a truth recovery process, and the rationale for that process. There is, it argues, no magic moment of ‘readiness’ for truth recovery: the conditions are constructed by political ‘willingness’ rather than spontaneously occurring. Much of the literature on Northern Ireland’s past provides historical analyses of the conflict – Republican, state or Loyalist violence – and is often (implicitly or explicitly) associated with one or other of the partisans in the conflict. This book focuses on the dynamic between the protagonists and how each of their positions, in this case on truth recovery, combine to produce the overall political status quo in Northern Ireland. As the society struggles to move forward, Marie Breen Smyth considers whether the entrenched positions of some, and the failure understand the views of others, can be shifted by a societal revisiting and re-evaluation of the past. 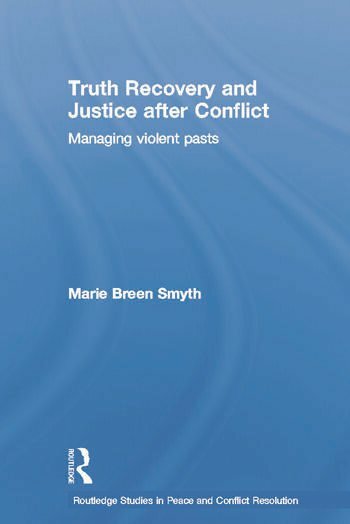 Truth Recovery and Justice after Conflict arises from a decade’s writing and research with both victims and those close to the armed groups in Northern Ireland. It is also informed by the author’s work in South Africa, West Africa, Israel and the Occupied Palestinian Territories. It will be of great interest to students and researchers in politics, international relations, peace studies and law. Marie Breen Smyth is Reader in the Department of International Politics, University of Wales, Aberystwyth; and Director of the Centre for the Study of Radicalisation and Contemporary Political Violence (CSRV). She has edited five volumes and written a number of books, including Northern Ireland’s Troubles: The Human Costs (with Mike Morrissey).